It's about time the attorneys stepped up! Most of us know that Bush 43 bought over 98,000 acres of land in Paraguay. Was the purchase to escape war crime tribunals? Jenna Bush paid a secret diplomatic visit to Paraguayan President Nicanor Duarte and U.S. Ambassador James Cason. There were no press conferences, no public sightings and no official confirmation of her 10-day trip which apparently ended this week. Immediately afterwards, 500 heavily armed U.S. troops arrived with various planes, choppers and land vehicles at Mariscal Estigarribia air base, which happens to be at the northern tip of Paraguay near the Bolivian/Brazilian border. More have reportedly arrived since then. What the hell, after the jump. Plus a BREAKING UPDATE involving, of course, The Moonies! Now, Prensa Latina is a Cuban-government operation that is not exactly friendly toward Washington, what with Washington trying to kill Castro for 50 years and all. But Prensa Latina didn’t invent the story. It’s all over the South American press — and not just Venezuela and Bolivia. Here’s a version from Brazil. And here’s one from Paraguay itself. As far as we can understand, all the paperwork and deeds and such are secret. But somehow the news leaked that a new “land trust” created for Bush had purchased nearly 100,000 acres near the town of Chaco. And Jenna’s down there having secret meetings with the president and America’s ambassador to Paraguay, James Cason. 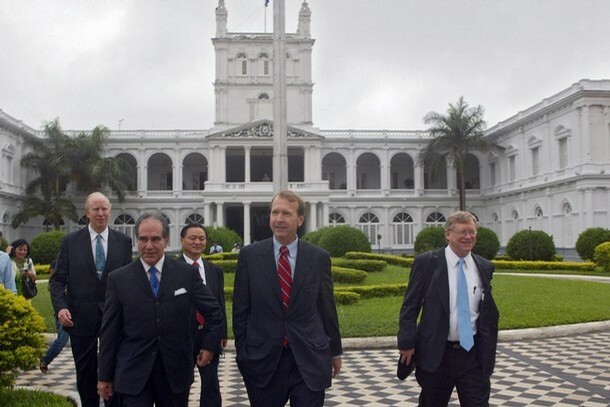 Bush posted Cason in Havana in 2002, but last year moved him to Paraguay. Cason apparently gets around. A former “political adviser” to the U.S. Atlantic Command and ATO’s Supreme Allied Commander Atlantic, Cason has been stationed in El Salvador, Honduras, Guatemala, Panama … basically everywhere the U.S. has run secret and not-so-secret wars over the past 30 years. Here’s a fun question for Tony Snow: Why might the president and his family need a 98.840-acre ranch in Paraguay protected by a semi-secret U.S. military base manned by American troops who have been exempted from war-crimes prosecution by the Paraguyan government? U.S. Special Forces began arriving this past summer at Paraguay’s Mariscal Estigarribia air base, a sprawling complex built in 1982 during the reign of dictator Alfredo Stroessner. Argentinean journalists who got a peek at the place say the airfield can handle B-52 bombers and Galaxy C-5 cargo planes. It also has a huge radar system, vast hangers, and can house up to 16,000 troops. The air base is larger than the international airport at the capital city, Asuncion. Some 500 special forces arrived July 1 for a three-month counterterrorism training exercise, code named Operation Commando Force 6. Paraguayan denials that Mariscal Estigarribia is now a U.S. base have met with considerable skepticism by Brazil and Argentina. There is a disturbing resemblance between U.S. denials about Mariscal Estigarribia, and similar disclaimers made by the Pentagon about Eloy Alfaro airbase in Manta , Ecuador. The United States claimed the Manta base was a “dirt strip” used for weather surveillance. When local journalists revealed its size, however, the United States admitted the base harbored thousands of mercenaries and hundreds of U.S. troops, and Washington had signed a 10-year basing agreement with Ecuador. We’ve been directed to yet another parapolitical theory here at Rigorous Intuition, where it is reported that Rev. Moon bought 600,000 hectares — that’s 1,482,600 acres — in the same place: Chaco, Paraguay. Another twist: The first story, from Paraguay, apparently refers to the senior George Bush as the owner of the 98.840 acres in Moon’s neighborhood. Isn’t that special? Oh, and both the Moonie and Bush land is located at what Paraguay’s drug czar called an “enormously strategic point in both the narcotics and arms trades.” And it sits atop the one of the world’s largest fresh-water aquifers. Â¿Bush compra campos en el Chaco paraguayo? El presidente estadounidense habrÃ­a adquirido cerca de 40 mil hectÃ¡reas en una zona estratÃ©gica por su cercanÃ­a al AcuÃ­fero GuaranÃ­, una de las reservas de agua mÃ¡s importante del mundo. La visita de su hija a la regiÃ³n fue lo que disparÃ³ los rumores. George Bush, presidente de los Estados Unidos, habrÃ­a adquirido cerca de 40 mil hectÃ¡reas de tierras en la zona de Fuerte Olimpo, en el departamento del Alto Paraguay, en el Chaco paraguayo, territorio ubicado muy cerca de la frontera con Bolivia, paÃ­s que preocupa mucho a la Casa Blanca. Hasta el momento ninguna fuente oficial del gobierno de Duarte Frutos quiso confirmar la compra, sin embargo fuertes rumores aseguran que el jefe de Estado norteamericano comprÃ³ las tierras y su hija Jenna recorrerÃ¡ el campo durante la visita que estÃ¡ realizando a Paraguay desde el pasado fin de semana, segÃºn informÃ³ Misiones Online. La nueva adquisiciÃ³n de la familia Bush estarÃ­a ubicada en una zona estratÃ©gica. La cercanÃ­a a la zona de la Triple Frontera no serÃ­a casualidad. En el lugar estÃ¡ ubicado el AcuÃ­fero GuaranÃ­, una de las reservas de agua mÃ¡s importantes del planeta. The GuaranÃ­ Aquifer consists primarily of sedimented sandstones deposited by fluvial and eolian processes during the Triassic and Jurassic periods (between 200 and 130 million years ago), with over 90% of the total area overlaid with igneous basalt of a low-permeability, deposited during the Cretacous period, acting as an aquitard and providing a high degree of containment. This greatly reduces the rate of infiltration and subsequent recharge, but also isolates the aquifer from the Vadose zone and subsequent surface-associated losses due to evaporation and evapotranspiration. Research and monitoring of the aquifer in order to better manage it as a resource is considered important, as the population growth rate within its area is relatively high — resulting in higher consumption and pollution risks. The Argentine film called Sed, InvasiÃ³n Gota a Gota ("Thirst, Invasion Drop by Drop"), directed by Mausi MartÃ­nez, portrays the military of the United States as slowly but steadily increasing its presence in the Triple Frontera (Triple Frontier, the area around the common borders of Paraguay, Argentina and Brazil). The overt reason for the increasing presence of U.S. troops and joint exercises, mainly with Paraguay, is to monitor the large Arab population which resides in the area. However, MartÃ­nez alleges that it is the water which brings the Americans to the area, and she fears a subtle takeover before the local governments even realize what is going on. Similar concerns were lifted following both the signature of a military training agreement with Paraguay, which accorded immunity to U.S. soldiers and was indefinitely renewable (something which had never been done before, while Donald Rumsfeld himself visited Paraguay and, for the first time ever, Paraguayan president Nicanor Duarte Frutos went to the White House), and the construction of a U.S. military base near the airport of Mariscal Estigarribia, within 200 km of Argentina and Bolivia and 300 km of Brazil. The airport can receive large planes (B-52, C-130 Hercules, etc.) which the Paraguayan Air Force does not possess.  . The governments of Paraguay and the United States subsequently ostensibly declared that the use of an airport (Dr LuÃ­s MarÃ­a ArgaÃ±a International) was one point of transfer for few soldiers in Paraguay at the same time. According to the Argentine newspaper ClarÃ­n, the U.S. military base is strategic because of its location near the Triple Frontier, its proximity to the GuaranÃ­ Aquifer, and its closeness to Bolivia (less than 200 km) at the same "moment that Washington's magnifying glass goes on the Altiplano [Bolivia] and points toward Venezuelan [president] Hugo ChÃ¡vez — the regional devil according to the Bush administration — as the instigator of the instability in the region" (El ClarÃ­n ). The U.S. State Department firmly [denies] these allegations. US President George W. Bush allegedly has recently purchased a 98,842 acre farm in Chaco, Paraguay atop the aquifer . The Reverend Moon has purchased 1,482,600 acres in Chaco, Paraguay. But there is nothing amusing about an enormous U.S. base less than 120 miles from the Bolivian border, or the explosive growth of U.S.-financed mercenary armies that are doing everything from training the military in Paraguay and Ecuador to calling in air attacks against guerillas in Colombia. Indeed, it is feeling a little like the run up to the ‘60s and ‘70s, when Washington-sponsored military dictatorships dominated most of the continent, and dark armies ruled the night. U.S. Special Forces began arriving this past summer at Paraguay's Mariscal Estigarribia air base, a sprawling complex built in 1982 during the reign of dictator Alfredo Stroessner. Argentinean journalists who got a peek at the place say the airfield can handle B-52 bombers and Galaxy C-5 cargo planes. It also has a huge radar system, vast hangers, and can house up to 16,000 troops. The air base is larger than the international airport at the capital city, Asuncion . Some 500 special forces arrived July 1 for a three-month counterterrorism training exercise, code named Operation Commando Force 6. The Bush administration has made the “Triple Frontier Region” where Brazil, Paraguay, and Argentina meet into the South American equivalent of Iraq's Sunni Triangle. According to William Pope, U.S. State Department Counterterrorist Coordinator, the United States has evidence that 9/11 mastermind Khalid Sheik Mohammed spent several months in the area in 1995. The U.S. military also says it seized documents in Afghanistan with pictures of Paraguay and letters from Arabs living in Cuidad del Este, a city of some 150,000 people in the tri-border region. The Defense Department has not revealed what the letters contained, and claims that the area is a hotbed of Middle East terrorism have been widely debunked. The U.S. State Department's analysis of the region—”Patterns of Terrorism”—found no evidence for the charge, and an International Monetary Fund (IMF) study found the area awash with money smuggling, but not terrorism. It is the base's proximity to Bolivia that causes the most concern, particularly given the Bush administration's charges that Cuba and Venezuela are stirring up trouble in that Andean nation. Bolivia has seen a series of political upheavals, starting with a revolt against the privatization of water supplies by the U.S. Bechtel Corporation and the French utility giant, Suez de Lyonnaise des Eaux. The water uprising was sparked off when Suez announced it would charge between $335 and $445 to connect a private home to the water supply. Bolivia's yearly per capita gross domestic product is $915. The water revolt, which spread to IMF enforced taxes and the privatization of gas and oil reserves, forced three presidents to resign. The country is increasingly polarized between its majority Indian population and an elite minority that has dominated the nation for hundreds of years. Six out of 10 people live below the poverty line, a statistic that rises to nine in 10 in rural areas. For the Bush administration, however, Bolivia is all about subversion, not poverty and powerlessness. When U.S. Secretary of Defense Donald Rumsfeld visited Paraguay this past August, he told reporters that, “There certainly is evidence that both Cuba and Venezuela have been involved in the situation in Bolivia in unhelpful ways.” A Rumsfeld aide told the press that Cuba was involved in the unrest, a charge that even one of Bolivia's ousted presidents, Carlos Mesa, denies. A major focus of the unrest in Bolivia is who controls its vast natural gas deposits, the second largest in the Western Hemisphere. Under pressure from the United States and the IMF, Bolivia sold off its oil and gas to Enron and Shell in 1995 for $263.5 million, less than 1% of what the deposits are worth. The Movement Toward Socialism's presidential candidate Evo Morales, a Quechuan Indian and trade union leader who is running first in the polls, wants to renationalize the deposits. Polls indicate that 75% of Bolivians agree with him. But the present political crisis over upcoming elections Dec. 18, and disagreements on how to redistribute seats in the legislature, has the United States muttering dark threats about “failed states.” U.S. General Bantz J. Craddock, commander of Southern Command, told the House Armed Services Committee: “In Bolivia , Ecuador , and Peru , distrust and loss of faith in failed institutions fuel the emergence of anti-U.S., anti-globalization, and anti-free trade demagogues.” Bolivia has been placed on the National Intelligence Council's list of 25 countries where the United States will consider intervening in case of “instability.” This is scary talk for Latin American countries. Would the United States invade Bolivia? Given the present state of its military, unlikely. Would the United States try to destabilize Bolivia's economy while training people how to use military force to insure Enron, Shell, British Gas, Total, Repsol, and the United States continues to get Bolivian gas for pennies on the dollar? Quite likely. And would the White House like to use such a coup as a way to send a message to other countries? You bet. President Bush may be clueless on geography, but he is not bad at overthrowing governments and killing people. Will it be as easy as it was in the old days when the CIA could bribe truckers to paralyze Chile and set the stage for a coup? Nothing is easy in Latin America anymore. The United States can bluster about a trade war, but the playing field is a little more level these days. The Mercosur Group of Argentina, Brazil, Uruguay, and Paraguay embraces 250 million people, generates $1 trillion in goods, and is the third largest trade organization on the planet. If the American market tightens, the Chinese are more than willing to pick up the slack. A meeting last month of the Ibero-American heads of state turned downright feisty. The assembled nations demanded an end to the “blockade” of Cuba . The word “blockade” is very different than the word “embargo,” the term that was always used in the past. A “blockade” is a violation of international law. The meeting also demanded that the United States extradite Luis Posada to Venezuela for the 1976 bombing of a Cuban airliner that killed 76 people. If the United States tries something in Bolivia (or Venezuela), it will find that the old days when proxy armies and economic destabilization could bring down governments are gone, replaced by countries and people who no longer curtsy to the colossus from the north. My article was written in late November 2005 during the run-up to the Bolivian elections. That campaign featured indigenous leader Evo Morales, a fierce critic of Washington's neoliberal, free trade policies that have impoverished tens of millions throughout Latin America. The Bush administration not only openly opposed Morales, it charged there was a growing “terrorism” problem in the region and began building up military forces in nearby Paraguay. There have been a number of important developments since last fall. Morales won the election and nationalized Bolivia's petrochemical industry. In the past, such an action might have triggered a U.S.-sponsored coup, or at least a crippling economic embargo. Foreign oil and gas companies immediately tried to drive a wedge between Bolivia and other nations in the region by threatening to halt investments or pull out entirely. This included companies partially owned by Brazil and Argentina. But Latin America is a very different place these days. Three days after the May 1, 2005 nationalization, Argentine President Nestor Kirchner, Brazilian President Lula De Silva, Venezuelan President Hugo Chavez, and Morales met in Puerto Iguazu and worked out an agreement to help Bolivia develop its resources while preserving regional harmony. As a result, it is now likely that foreign petrochemical companies will remain in Bolivia, although they will pay up to four times as much as they did under the old agreements. And if they leave, the Chinese and Russians are waiting in the wings. The situation is still delicate. U.S. Defense Secretary Donald Rumsfeld recently compared Chavez to Adolph Hitler and linked him to Cuba's Fidel Castro and Morales. Aid is flowing to militaries in Colombia and Paraguay, and the White House continues to use private proxies to intervene in the Colombian civil war. While there is a growing solidarity among nations in the southern cone, some of their economies are delicate. Ecuador is presently wracked by demonstrations demanding the expulsion of foreign oil companies and an end to free trade talks with the United States. This is an ongoing story. While the alternative media continues to cover these developments, the mainstream media has largely ignored them. A note on reading the mainstream: the Financial Times recently highlighted a Latinobarometro poll indicating that most countries in South America were rejecting “democracy” as a form of government. But since free markets and neoliberalism were sold as “democracy”—economic policies that most South Americans have overwhelmingly rejected—did the poll measure an embrace of authoritarianism or a rejection of failed economic policies? Tread carefully. We are going to have to pay attention to this because after the new World Order sicks there UN minions on us and creates there little emergency were all going to have to go pay a visit to Paraguay. Two more great posts Sane! Where do you find these articles? The land grab project of U.S. President George W. Bush in Chaco, Paraguay, has generated considerable discomfort both politically and environmentally. Concern increased last week with the arrival of Bush's daughter, Jenna, and a source from the Physical Planning Department saying that most of the Chaco region belongs to private companies. Luis D'Elia, ArgentinaÂ´s undersecretary for Land for Social Habitat, says the matter raises regional concern because it threatens local natural resources. He termed it "surprising" that the Bush family is trying to settle a few short miles from the US Mariscal Estigarribia Military Base. Argentinean Adolfo Perez Esquivel warned that the real war will be fought not for oil, but for water, and recalled that Acuifero GuaranÃ­ is one of the largest underground water reserves in South America, running beneath Argentina, Brazil, Paraguay and Uruguay (larger than Texas and California together). "The southern U.S. states are already struggling with water shortages," asserted the 1980 Nobel Peace Prizewinner. This article originally appeared in Prensa Latina. It is his way of "Investing in the American Economy". I've been researching this and have gone over several web threads. Bush officially denies the land purchase but there is a lot of smoke and initial confirmation frrom Brazil and Paraguay. Also the key to the connection is Rev. Sun Moon. It appears as of 2008 Rev. Moon owns over 1.5 million acres on the Brazil side of the Paraguay Border and 1.5 Million acres on the Paraguay side. Recent trips to Paraguay/ Brazil have been made by Jenna Bush and Neil Bush. Villagers say Moon's 1.48 million-acre property is the largest unproductive estate in Paraguay, where a privileged few own much of the land. The Unification Church's intentions have been questioned elsewhere. It has bought property on both sides of the Brazil-Paraguay border, and Brazil has investigated Moon disciples over money-laundering and tax-evasion allegations. Russian Intelligence Analysts are reporting today that the American Presidentâ€™s daughter, Jenna Bush, has secured on behalf of her father, the American President, and the Bush Family, the purchase of nearly 100,000 acres of land in the South American Nation of Paraguay, and which is also confirmed by the Latin American News Service, and as we can read as reported in their article titled "Bush Buys Land in Northern Paraguay"
"An Argentine official regarded the intention of the George W. Bush family to settle on the Acuifero Guarani (Paraguay) as surprising, besides being a bad signal for the governments of the region. Luis D Elia, undersecretary for the Social Habitat in the Argentine Federal Planning Ministry, issued a memo partially reproduced by digital INFOBAE.com, in which he spoke of the purchase by Bush of a 98,842-acre farm in northern Paraguay, between Brazil and Bolivia." The American Presidentâ€™s daughter had used the cover of a United Nations group to â€˜coverâ€™ her mission to Paraguay to arrange this massive land purchase, and as we can see confirmed by the Associated Press News Service in their article titled "Jenna Bush joins UNICEF program in Paraguay"
The Moonies have just trumpeted the latest delegation of their dreaded leader, Sun Myung Moon, to the Bush presidential library in College Station, TX. The occasion: a statesmanlike party Moon was throwing in D.C., from April 28 to May 2, 2008, celebrating his dreams of influencing world events and burying Jesus Christ. About two weeks ago Moon made the latest of a long series of appearances with former President George H.W. Bush â€” this time at the Bush Presidential Library in College Station. And as reported here two years ago, the Washington Times Foundation (Moon is founder and owner of the Times) covertly donated at least $1 million to the Bush Library. The Governor of Alto Paraguay, Erasmo RodrÃ­guez Acosta has admitted to hearing that George Bush Sr. owns land in the Chaco region of Paraguay, in Paso de Patria. Acosta says that rumor has it that Bush owns near to 70 thousand hectares (173,000 acres) as part of an ecological reserve and/or ranch. However, the governor said he had no documents to prove the rumor. Acosta said that some stories credited the land to the FundaciÃ³n Patria, which Bush would be a member of. He termed it â€œsurprisingâ€� that the Bush family is trying to settle a few short miles from the US Mariscal Estigarribia Military Base. Why might the president and his family need a 98,840-acre ranch in Paraguay protected by a semi-secret U.S. military base manned by American troops who have been exempted from war-crimes prosecution by the Paraguyan government? Pantera Petroleum, Inc. is a publicly traded oil and gas exploration company (NASDAQ OTC BB: PTPE) headquartered in Austin, TX with operations in Midland, TX, Pecos County, TX, and Asuncion, Paraguay. Pantera Petroleum, Inc is a publicly traded oil and gas exploration company (NASDAQ OTC BB. PTPE) headquartered in Austin, Tx with operations in Asuncion, Paraguay. In South America, Pantera has rights to an 85% stake in five concessions representing 3,872,000 acres, or 6,050 square miles (roughly the size of Kuwait), in Paraguay in a well established hydrocarbon area, named the CHACO BASIN. Americans "hate" him. America is going down soon. I wouldn't blame him for leaving,He knows something is about to happen here. Explain to me why he would stay? I would leave to if I had the chance. Yeah, he sunk the boat now he's jumping ship!! I hope they find him and bring him to justice on all the war crimes, he and his pals have committed!! Dont put all the blame on Bush & Co. He may have been a pawn, but he did his job very well. He is just to blame as everyone else!! Makes no sense going on about it. Do you know our collective consciousness is what changes things and events? But it takes the individual to first become silent inside, even just for a short while as many times during a day that you can. We each have to lift our awareness out of learned behavior and deep ignorance, collected over many centuries. Practicing concentration, contemplation and meditation.........clears blockages in the body and auric body, the result of such efforts ='s wake up. The instant we begin to focus and practice on the above mentioned, these efforts become part of the collective consciousness. There is more awareness, the light shines in the darkness and certain ideas and emotions can no longer survive...old foundations and learning's fall away. With many of us doing this, we become a force of light so strong, that those who would just as soon see you as a slave, well! they no longer hold power over us...the "collective". That is how we bring about change. By always going on about what the people in Government are doing changes nothing, it only encourages that mind set, actually collectively we are creating this saga and giving our leaders the power to continue with business as usual. People always put in power a government who matches the level of understanding and wisdom we live, collectively. In my opinion people have woken up and many are not prepared to go on like sheep, which means we have chosen a President according to our level of consciousness. Give President elect, Obama a chance, at the very least. It is kind of laughable hearing Obama referred to as an African American, I wonder what that means, really? He is half white and half black. Seems fair to me...haa. ps: the chem-trail dumping in Montana today has been non stop. Bush probably read somewhere how a lot of the Nazis fled Germany after WW2 to live in South America and has decided to do the same thing. 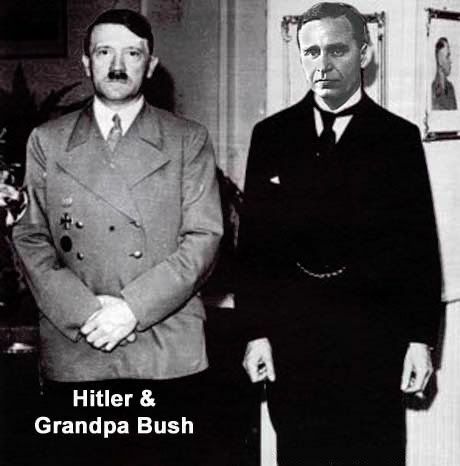 After all his grandfather Prescott Bush was one of Hitler's handlers. 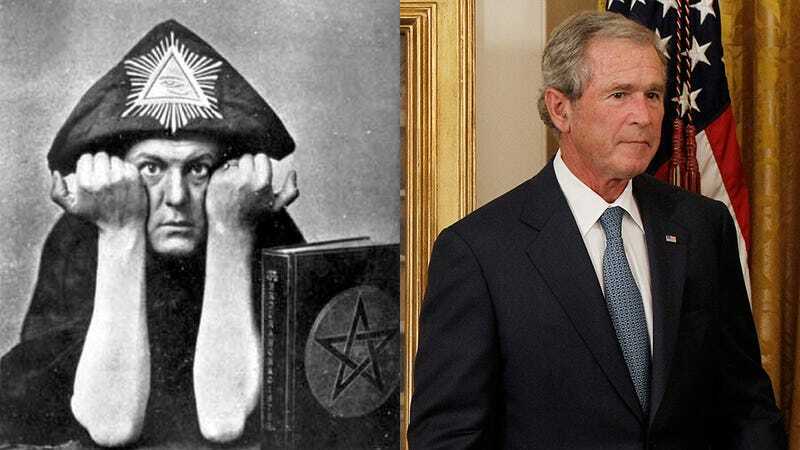 There are alot of interseting connections between Standard Oil (Rockefeller), the Nazi's and the Bushes. "The first truth is that the liberty of a democracy is not safe if the people tolerate the growth of private power to a point where it becomes stronger than their democratic state itself. That, in essence, is fascism - ownership of government by an individual, by a group, or by any other controlling power. This shows the links between Rockefeller Dulles Forrestal Bush et al. 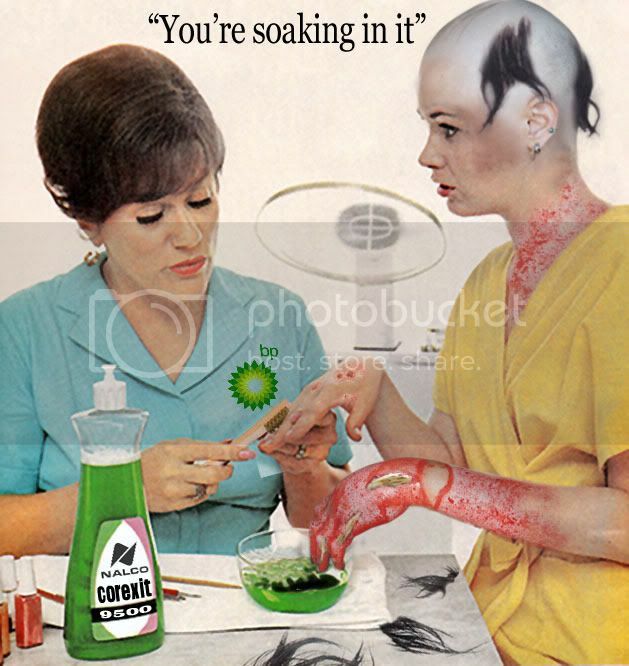 Standard Oil continued to supply the Nazi oil all thru wwII. Much of this oil came from South America. 1994 publication of Loftus' and Aarons' Secret War Against the Jews . They reveal that Rockefeller was a Nazi sympathizer during World War II. Worse, they reveal, he was a traitor: there are transcripts of telephone conversations between Rockefeller and Nazi agents in South America in which Rockefeller arranged the sale of tons of petroleum products to Nazi Germany. What is really significant about these transcripts is the date: 1943, in the middle of World War II (Loftus and Aarons 270-91). Like his partner Allen Dulles (attorney of George Bush's father, Prescott Bush, sr., during this same time), Forrestal had been found to have engaged in treason, as well, on a milder level. Although Forrestal loved the U.S. troops and went into battle on the front lines with them, he was busily working with Dulles to arrange a negotiated peace with the Axis, behind FDR's back. (Loftus and Aarons 79-80, 89-90, 136-40, 149-50). Devine reportedly saw Forrestal involved in destroying an aircraft. This aircraft, Devine eventually assumed, had been "Amelia Earhart's Plane." However, evidence now suggests that the plane in question was actually a TBM Avenger plane which had been piloted by (later President) George Bush, then a Navy pilot in the Pacific.. Bush had landed his plane on Japanese-held Guam on June 19, 1944, at Forrestal's behest. The fall of the Marianas, including Guam, would mean that Japan proper could be subject to U.S. bombing raids again, as it had been briefly in June, 1944, until the Japanese, with the connivance of Chiang Kai Shek (at the encouragement of Dulles) had captured the huge new U.S. Army Air Force bases in Northern China, from which the first regular bombing raids had started to hit Japan proper in early June, 1944. By the end of June, these airfields had fallen to the Japanese, as Chiang sold out his troops in return for the promise of Japanese help against Mao (Bagby 233-6). Nice work Tahoe. Thank you for the posts! Niel has aged some since he helped loot over a billion dollars from Silverado Savings in the 80s. What possible harm could these fellows do? - Republican pundit Kevin Philips. While opportunism isnâ€™t new in U.S. politics, never did so many in one family extract so many dollars from taxpayers as when George Bush senior was president a decade ago. As documented below from impeccable cited sources, the exploits of six Bushes, including George W., range from stock sales that were probed or sanctioned to arranging U.S. business investments for a Japanese Mob front. They range from lobbying for a Mafia-linked businessman that enabled massive Medicare fraud to misconduct that helped trigger S&L collapses costing taxpayers $1.2 billion. It was thus not entirely coincidental that under Bush senior in 1992, U.S. taxpayers faced a $500 billion S&L bailout2 and the largest ever budget deficit, $290 billion. This contrasts with the largest surpluses ever under Clinton-Gore. George W. Bush asks for trust, yet his evasions about his own dealings and recent campaigning with brother Jeb immerse him within a family financial scandal of alarming scope. NEIL BUSH (George Wâ€™s brother) was a principal in the 1988 collapse of Silverado Banking in Denver, which cost taxpayers $1 billion. Neil approved $132 million in unrepaid loans from Silverado to two business partners, who in turn arranged payments to Neil totaling $650,000. JEB BUSH (George Wâ€™s brother) and a partner defaulted on a $4.5 million loan from a Florida S&L in 1988. The default helped trigger the S&Lâ€™s collapse, which cost taxpayers $285 million. Bush and partner repaid only ten percent of the irregular loan and, incredibly, also got to keep the real estate that collateralized it. In 1985, Jeb lobbied the federal government on behalf of Miami HMO owner Miguel Recarey to increase Recareyâ€™s Medicare business ultimately to a total of $1 billion. The following year, Jeb received $75,000 from Recarey. Recarey, who had longstanding business ties to the late Florida Mafia boss Santos Trafficante, subsequently fled the U.S. under indictment, suspected of up to $100 million in Medicare fraud. GEORGE W. BUSH. On June 20, 1990, Bush, a director of Harken Energy, sold the bulk of his Harken stock for $848,000. A week later, the stock plummeted in value on news of a large quarterly loss. Bush claimed that he had submitted a required report about the stock sale but it had somehow disappeared.6 Bush refused repeated requests from both The Wall Street Journal7 and U.S. News and World Reports8 to discuss the stock sale. JONATHAN BUSH. In 1991, George seniorâ€™s brother Jonathan was fined $30,000 in Massachusetts and $4,000 in Connecticut for violating registration laws governing securities sales. Jonathan was barred from securities brokerage with the general public in Massachusetts for one year. PRESCOTT BUSH. In 1989, Prescott Bush, a brother of George senior, arranged investments by a Japanese Mob front company in two U.S. firms, for which he was paid $500,000. The underworld front ultimately gained a controlling interest in both U.S. firms, and both subsequently filed for bankruptcy.18 Bush denied knowledge of the underworldâ€™s role in these deals, which came under investigation by Japanese police and in the U.S.
George Wâ€™s talk of integrity and plans for privatized social security appear to be somewhat of a hustle considering this Bush family record and what happened to the S&Ls during his fatherâ€™s presidency. George W. may have trouble convincing U.S. voters to reinstate Bush family ethics and economics as national policy. I guess since the Bushes have nearly worn out their welcome, Paraguay looks pretty good. Maybe the Bush family said "f#ck it, since everyone knows we're criminals, we'll start our own cocaine cartel and sell to the CIA". Interesting and infromative. thank you, good research. I'll try to make a one liner, Bush and his mateys may be in for a suprise if they move to Paraguay. I'm certain the big dogs will woo him and guarantee his safety. he will certainly feel a king among the peasants. He will be in for a suprise the likes of which he has never anticipated. Contrary to news reals and Murdochs comic book news, the knowlegable educated indivuduals, many within their own rights powerfull, are disqusted with this peice of human waste. It could be he is walking into the lions den. Many underestimate the South American "human beings". At least we'll know where he'll be. Maybe Bushy is feeling guilty about the *cough* carbon footprint he has created in the Middle East and he's gonna try to clean it up with his 99,000 acres. It'll probably come out in the near future that the largest landowners will receive carbon credits due to their foliage scrubbing the air. So once again the elites will get paid and well, we'll just get bent over. But a growing number believe this version of events to be untrue, subscribing instead to the theory that Hitler was among thousands of Nazis to seek refuge in South America. Abel Basti is one of those to detail this hypothesis in his book El Exilio De Hitler (Hitler in Exile), a new edition of which was recently published in Argentina. The historian believes Hitler exited the bunker beneath the Chancellery in Berlin via a tunnel, which took him to Tempelhof Airport, where a helicopter spirited him to Spain. From there, he claims he travelled to the Canary Islands where a U-boat waited to take him to Argentina. Hitler is alleged to have spent a decade in the country, before moving to Paraguay, where he lived under the protection of President Alfredo Stroessner, who had German roots. The former Fuhrer died there on 3 February 1971, Basti believes. George H.W. Bushâ€™s Father was Prescott Bush. Prescott helped finance Hitlerâ€™s rise to power.